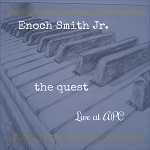 CD review: "The Quest: Live At APC" by Enoch Smith Jr.
Buy it now from Misfitme Music. This review first appeared on Feb. 14, 2017 at AllAboutJazz.com. His latest, The Quest: Live at the APC, finds Smith fronting two different trios with two different vocalists—but finding very similar results: Praise music given a jazz arrangement, and performed in a jazz vein. "Wheels Up" is a straight-ahead post-bop number with the kind of memorable hook that invites others to interpret this composition in the years to come. Smith's assertive piano lead is backed sympathetically by bassist Mimi Jones and drummer John Davis. In his aggressive use of right hand to flesh out the melody, with the left hand providing punctuation and emphasis, Smith shows some strong Basie influences  albeit a far more musically verbose version! The opening track, "Searching for God," is pure jazz despite the title. It features a spare theme, only a few bars long, but it's a fascinating listen as Smith and bassist Noah Jackson come at it from a variety of angles in both subsequent verses and in extended extrapolations. Here, Smith's playing is equally distributed to both hands, and toward the last third of the song as the intensity heats up, he's into full Art Tatum / Mike Wofford territory. The title track opens with a spiraling cascade on piano before Smith slows it down and begins exploring the melody. Equal parts introspective and spirited, the tune is much like "Searching for God"  the basic framework is fairly simple, yet has more than enough there for the band to spend four and a half minutes exploring without ever sounding bored or repeating themselves.